1 technological advantage | This Blog Rules | Why go elsewhere? Biological Legs are a Disadvantage? Hugh Herr rock climbs with his prosthetic legs and believes that, ‘It’s really sad to have biological limbs, you’re constrained by nature and you can upgrade. The artificial parts of our body are immortal.’ Herr isn’t just a double amputee, he’s also an MIT Professor specializing in Prosthetics. 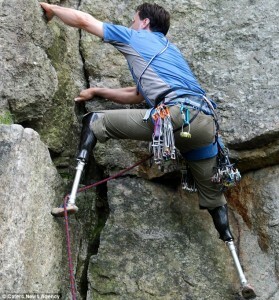 He uses different prosthetics for climbing than for hiking or running. So can prosthetic legs be an advantage? There are some pretty interesting conversations going on out there about an unfair competitive advantage for those that have artificial limbs. It’s actually quite impressive that technology has come so far that a double amputee can make it to the Olympics using artificial running prosthetics (blades) called “Cheetahs”. South African Oscar Pistorius ran in the 400m Olympic Finals yesterday as the first double amputee to compete in the Olympic games. Oscar was kept out of the 2008 Olympics because his artificial limbs were considered an unfair technological advantage. For the 2012 Olympics, however, Pistorius was able to compete. His Olympic debut was a 7th place finish in his 400 meter heat. Artificial limbs are not the only technology being debated. In the 2008 Olympics, the LZR Racer swim suits were allowed and 90% of races were won by swimmers wearing the LZR Racer Swim Suit. The 2012 Olympics did not allow those suits, determining that they provided an unfair advantage to swimmers. Still the 2012 swim suits take advantage of technology as well. Bicycle advances may also provide an unfair technological advantage for specific riders and teams. What other technologies may be providing unfair advantages? Do you think fake legs constitute an unfair advantage?